An aggressive emissions bill commits the state to making deep cuts in emissions by 2030. As the world’s sixth-largest economy, California wields huge influence not just in the U.S., but around the world. So when Governor Jerry Brown signed two bills into law Thursday aimed at reducing the state’s greenhouse gas emissions to 40 percent below 1990 levels by 2030, it put the world on notice that the Golden State aims to be a major player in the fight against climate change. The thing is, it’s far from clear just how the state will go about achieving that target. In 2006, Governor Arnold Schwarzenegger signed a bill calling for a return to 1990-level emissions by 2020. He didn’t give a lot of details as to how that was supposed to happen—but legislators responded by passing laws, including one that implemented a cap-and-trade system. 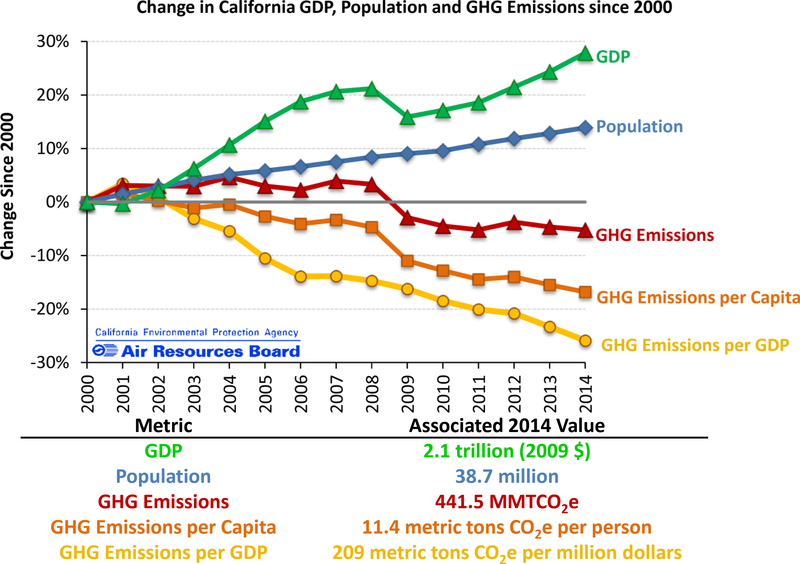 Here in 2016, California is well on its way to hitting its Governator-mandated emissions target, and its economy is going strong. We’re talking about a world where California gets more than 50 percent of its electricity from renewables in 2030 (up from 25 percent today), where zero-emissions vehicles are 25 percent of the fleet by 2035 (up from about 1 percent today), where high-speed rail is displacing car travel, where biofuels have replaced a significant chunk of diesel in heavy-duty trucks, where pastures are getting converted to forests, where electricity replaces natural gas in heating, and on and on. The planned closure of the Diablo Canyon nuclear power plant also looms large as a potential speed bump. The plant currently provides about 9 percent of California’s electricity, but is slated to close in 2025, part of a nationwide pattern of retiring nuclear reactors that could lead to an increase in carbon emissions. All of that said, California has made huge strides in reducing emissions since Schwarzenegger first signed that bill a decade ago. The state’s economy appears not to have missed a beat, totalling $2.4 trillion in 2015. It’s the largest in the U.S. in terms of solar power generation, and third-largest in wind. It may yet have a long way to go to reach its own ambitious goals. But it’s certainly heading in the right direction. DeepMind’s use of neural networks to synthesize speech could finally make computers sound more human.